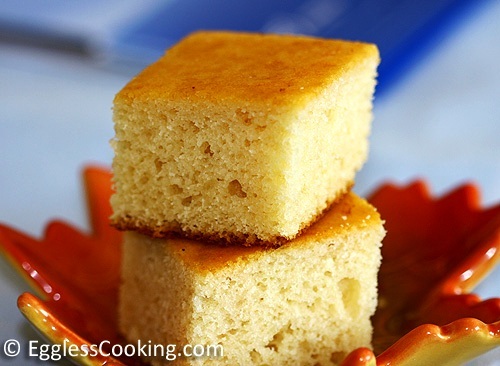 Eggless Vanilla Cake: When I posted this eggless vanilla cupcake recipe a few weeks back, I was being asked if it could be baked without the egg replacer powder. I suggested increasing the quantity of baking powder to substitute EnerG. Some did it and got good results and some didn't. I too made some changes to that recipe to bake it without EnerG but did not get satisfactory results. The cupcakes did not turn out as good as the ones with Ener-G. So I was looking for another eggless vanilla cake recipe which can be baked with simple ingredients and landed on this one. I have come across this recipe before and somehow didn't get a chance to try it until recently. Since the visitors' request for a simple eggless cake was becoming more frequent I decided to give it a try and I would say that I was not disappointed at all. It was not as fluffy and airy as the cupcakes but was definitely a decent recipe. After going through the reviews of the original recipe I have made a couple of changes to make it better. The only other thing I would like to try the next time is to use cake flour instead of all-purpose flour. I think that particular variation will give a lighter texture to the cake. So do try it when you get a chance. 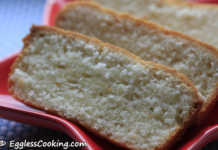 This Eggless Vanilla Cake is simple to bake and uses readily available ingredients. The taste and texture makes it perfect for any occasion. Preheat the oven at 350F/180C for 15 minutes. Lightly grease a 9x13 inch pan and line it with parchment paper. In a large bowl sift together the flour, baking powder, baking soda and salt. Mix in the sugar. Make a well in the center of the dry ingredients and stir in the the wet ingredients one by one. Stir the mixture together using a whisk. Some lumps is okay. Pour the batter in the prepared pan and tap the pan to even it out and break the air bubbles if any. Bake it for 25-35 minutes. The first time I baked this eggless cake I checked it for doneness after 30 minutes and felt that I could have taken it out 2-3 minutes earlier. The bottom had started to brown more than it is required to. So I did that the next time and took the pan out the oven after 27 minutes itself and the cake turned out to be perfect. Transfer the pan to a cooling rack and remove the cake after 15-20 minutes. Place the cake on the rack for it to cool down completely before slicing it. The texture of this eggless vanilla cake is neither too fluffy nor too dense making it a perfect base for shaped cakes and decorating. It slices off beautifully without crumbling. The sweetness of the cake is just right if you are going to frost it. Actually, we preferred this sweetness even without the frosting. But if you are looking for something very sweet then you have to definitely increase the quantity of sugar anywhere between 1/4 cup to 1/3 cup. This cake was a huge hit in our family and with our friends. If you can't find Ener-G egg replacer and try the best eggless vanilla cupcake recipe then this plain eggless cake with condensed milk is the way to go. As mentioned earlier try cake flour for the all purpose flour used in the recipe to get a fluffier cake. Freshly squeezed orange juice and grated orange zest can be used instead of water to give a nice flavor to the cake. In Canada we get a 300ml can of condensed milk unlike in the US where you can get a 14oz can (which is approximately 400ml). The original recipe uses a 14oz can and I think that's the reason my cake was not very sweet. I had to substitute quit a few ingredients and it turned out disgusting. It was a rubber mat! I had to use gluten free all purpose flour, erythritol for the sugar, coconut sweetened condensed milk and coconut oil for the butter. It was horrible. I had to bake it 35 minutes. I’m glad I made this as a practice cake weeks before my son’s 2nd birthday. I would have really embarrassed myself! Yes, Melanie, gluten-free baking and especially with all these substitutions it’s not a surprise that you didn’t get it right the first time itself. You have to try a couple more times before you can perfect the recipe to suit your specific needs. Nothing much actually, Sonia. The recipe just needs liquid and it can be anything. Orange juice, almond milk, water, dairy milk doesn’t matter. Full fat milk might increase the moistness and richness of the cake, but if you are using fat free milk it isn’t any different than water. Can we use oil instead of butter? Can you use margarine instead of butter!? 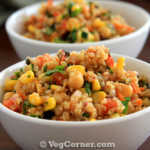 Hi, I’ve made this recipe several times and its always a hit. I am wondering though, would I be able to make this into a 2-tier 9” round cake or would I need to double the recipe? Thanks! Thanks for the feedback, Sarah. Yes this recipe is enough for a 2-tier 9/8 inch round cake. You don’t need to double the recipe. Please check the baking measurements page, Shilpa. Thanks for the feedback, Sundari. In your eggless vanilla cake you state 2tbsp of vinegar. Please can you tell me what vinegar to use,ie. malt vinegar,apple cider vinegar etc. I personally prefer apple cider, but white vinegar is fine too. Hi Renee, I have not baked in a convection oven yet. The 180C is for the conventional oven. I think 23-25 minutes should be enough. But test for doneness around 23 minutes and you should be able to guess if it requires more time or not. Thanks so much for your reply. One other question regarding Sugar. What type of sugar do you use ? In Australia we have sugars that include, White Sugar (which is typically table sugar and is quite granular), Caster Sugar (which is more refined) and Icing Sugar (which is most refined and I think would be comparable to confectioners/powdered sugars). I think most recipes usually call for granulated sugar which I think is our White Sugar. Do you have any experience with the comparatives in Australia ? Thanks in advance for your time! You’re welcome Renee. Please use the granular/white sugar. Above Rachel mentioned ‘Water Bath’. Please explain how to do it. Kiran, usually water bath is done for cheesecakes to avoid getting cracked, by placing a pan of hot water in the oven to provide moisture. I have not tried it for any of my recipes so far. 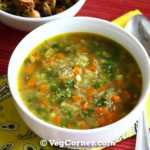 This is my no-fail recipe, Shital. Please do give it a try again. What did you think went wrong? I wanna bake this as a round birthday cake. What size of the pan would be the right size . And I read somewhere in comments about water bath. Would it make a difference if I bake with water bath or without? Sorry Madhu, my mobile has auto corrected the name..
No problem, Kim. This recipe will make 2 round 8 or 9 inch round cakes. So you will have to halve the recipe if you just want one round. I have never tried the water bath in any of my recipes. I have made this recipe so many times and it comes out great each and every time without any water bath. So I don’t know how the texture will differ with the water bath. 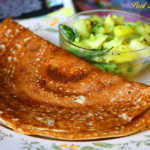 Hi.. just today I came to know about u and ur recipes.. I love to give it a try.. but I m not sure what have I missed so far.. do u have any websites or YouTube subscription where I can find all ur so far recipes?? Pls let me know.. thank you.. Thank you Maha. All my recipes are in this website itself. Please check the menu options to find out all the recipes. Made this today with orange juice. Turned out very good. I had to cover t with foil and lower the temperature to let the cake center cook since the sides were already brown but center not cooked. Would a water bath help in helping the cake stay moist? Is this something anyone has tried? Yes it will, Rachel. I wasn’t aware of that technique when I baked this cake. I did start using it once I made this strawberry sponge cake recipe. I am dairy free. What would be the best substitute for condensed milk? 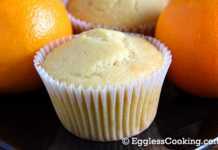 Try the measurements and ingredients I have given in this eggless cupcake recipe and substitute the milk with any non-dairy milk of your choice. It’s basically the same recipe and I have used milk and sugar to replace the condensed milk. 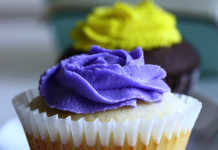 You can use this cupcake recipe to make the cake as well. Hi I tried this recipe it came exactly as you said…first time when I tried I made butterscotch frosting…this time I mixed and topped the cake with butterscotch chips…omg…its awesome…and excellent flavor…my hubby loves it…thank you so much for sharing this recipe with us…. You’re very welcome Meena. I have never tried butterscotch frosting. You’re comment is making me drool to make one immediately. I love butterscoth flavor. I wonder if you are able to help please. I want to make this cake in 6 inch pans, i tried using two 6 inch tins and it was not cooked enough in the middle. Any ideas please, would it work in 3 x 6 inch as might be less deep? Hmm…I’m guessing the batter was way too much for 2 pans. As you have pointed out maybe 3 should work. Hello, I tried your recipe and it came out really good. I tried a different egg less chocolate cake which was good in taste but crumbled while cutting it. I was wondering if I use this recipe for chocolate cake (as cutting was really clean and smooth. I was really impressed with myself 😉 and your recipe as I never had luck with cake in the past ;)) but not sure how much quantity of cocoa powder. I have to prepare egg less chocolate cake for around 50 people in next 3 days and I don’t have time to experiment anything new. It would be great if you could guide me here. Thanks in advance! Thanks Kanchan and sorry too. I didn’t see this comment earlier. I don’t know if you need an answer now because it’s already 3 days now. Trust me and try this vegan chocolate cake for best result instead of experimenting with the vanilla cake. That being said, I am unaware of how much you will have to multiply the recipe to make it for 50 people. Can I make this recipe in a bundt cake pan? Is so, what changes in the recipe are needed? You can make it Evelyn. Only the baking time will vary. I think it will take close to 35-45 minutes time range. Test around 35 minutes and increase the time accordingly. Thank you for the awesome recipe…this is my first time ever baking from scratch and turn out well…i was using cake flour, as expected, it is so fluffy. 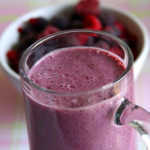 I like it very much…thank u and keep on sharing great recipes ya! That’s great Aneeta. You’re welcome. Original recipe calls for 1 cup melted butter, but your recipe calls for 1/2 cup butter. Which one is right? I would like to make this cake for potluck, because some fo my coworkers don’t use eggs in their cooking. Hi Alla, as mentioned in my post I have made some changes after reading the reviews. That’s why I have reduced the quantity of butter to 1/2 cup. Sorry Asha, I have not tried making it in a pressure cooker, so don’t know how it will turn out. I Can't Believe It's Eggless Chocolate Cake!